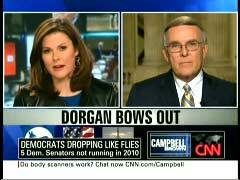 CNN continued its spin on the retirement of Senator Byron Dorgan on Wednesday. Anchor Campbell Brown one-upped Wolf Blitzer's "moderate Democrat" tag of the senator, going so far to label the liberal a "conservative Democrat." Correspondent Dana Bash also noted how the outgoing senator is apparently "popular" in his state, contrary to recent polls. Not once was Dorgan labeled "liberal" or "left." Brown's interview of Dorgan aired at the bottom of the 8 pm Eastern hour. During the second half of the segment, the anchor expressed some of the left's concerns over his decision to not run for reelection: "You know, this is that rare moment where Democrats have a supermajority and are able to get through what they wanted to accomplish. And so there are people- fairly or unfairly- who are saying, why are you doing this to us now?" Later in the interview, Brown asked about how President Obama's agenda has affected his last year in office, and included her misleading ideological label of the Democrat: "Politically, how tough has it been, given President Obama's very ambitious agenda on everything from health care, on energy regulation- especially for a conservative Democrat, how tough did that make your political life?" As Mike Bates pointed out on NewsBusters on Wednesday, Dorgan actually has a left-wing voting record. In addition to his 100% ratings from NARAL Pro-Choice America and the AFL-CIO in 2008, the North Dakota Democrat has an American Conservative Union lifetime rating of 16.57%. Earlier in the day, senior congressional correspondent Dana Bash led the 7 am Eastern hour of American Morning with Senator Dorgan's retirement: "Let's start with Byron Dorgan. He was a big surprise. He's popular back home, but he actually appears to be a victim of the intense polarization of Washington. A close associate of his told me yesterday he's just frustrated and he has been for months." Two recent polls cited by Bates in his NewsBusters post on Wednesday outlined that Dorgan was actually trailing his possible Republican opponent in the 2010 Senate race. Other than Blitzer's "moderate Democrat" label on Tuesday and Brown's "conservative Democrat" moniker on Wednesday evening, CNN's coverage on those two days did not give Dorgan any ideological identifications. Only his Democratic Party affiliation was mentioned. CNN correspondent Jessica Yellin even tried to mask the bad political news for the Democrats after the retirements of Senators Dorgan and Chris Dodd by playing up the potentially tough Senate races for Republicans during a segment eight minutes into the 6 pm Eastern hour on Wednesday's Situation Room. After noting what it would take for the GOP to regain the majority, Yellin concluded that Republicans faced an "uphill climb." A chyron on screen proclaimed, "Republicans Could Lose Big Seats: 6 GOP senators retiring." WOLF BLITZER: While Democrats have reason to worry, do Republicans also have some reason to fear regarding those Senate elections come November? Let's bring in our national political correspondent, Jessica Yellin. She is looking at this part of the story. What are you seeing, Jessica? YELLIN: Well, Wolf, there are six Republican senators who are retiring this year. All but one of them are long-term office-holders. Here is a look at all of them, and it is usually easier for a party to reelect an incumbent than win an open race. So, this creates some vulnerabilities for the Republican Party. Now, four of these races can be considered toss-up seats. First of all, there's Ohio, where Republican Senator George Voinovich is retiring. Obama won this state in the presidential election, and that Senate race could really go either way. Another swing state, Missouri. Senator Kit Bond is retiring. Democrats really do have a chance of picking up a seat there, too. Also, in New Hampshire, Senator Judd Gregg [wrong picture is displayed on screen]- this is Senator Michael Bennet of Colorado. He's in a tough race for Democrats. Okay. Senator Judd Gregg of New Hampshire- he is in jeopardy of- he's retiring, but Republicans are in jeopardy of losing that Senate seat as well. Wolf, even Florida, where Senator Martinez is retired. Now, current Governor Charlie Crist, you have thought he would be a shoo-in for Republicans to win that seat because he is so well known, but because of internal fighting in the party, Republicans could even fumble that race. So, while Democrats stand to lose seats on their side, they could keep up their total count if they pick up just a few of those Republican seats we just mentioned. Wolf? BLITZER: How hard would it be, Jessica, for the Republicans to actually take control of the Senate? YELLIN: Well, that's the big question. See, to win a majority, of course, you need 51 seats for the Republicans. They would first of all have to hold on to all those six Senate seats I mentioned, plus, they would have to pick up an additional 11 seats, and in politics that is what you call an uphill climb- not likely to happen. Wolf? BLITZER: It certainly is an uphill climb. All right, thanks very much, Jessica Yellin.